Rumors are circulating again of BMW building a production facility in Mexico. BMW broke ground on a new production facility in Brazil last year that will eventually have the capacity to assemble 30,000 vehicles annually. Whether the Brazilian plant can or will be expanded beyond a meager 30,000 production number (approximately a tenth of the current capacity of the Spartanburg, SC facility) is unknown and without a thorough examination of tariff and trade agreements an educated guess cannot be offered. But reading the press release for the Brazilian plant, and having interviewed production personnel over the years, one can make some assumptions of what a new Mexican production facility would entail. There has to be room for a supplier park (or an existing supplier park with Tier 1 suppliers already running- with additional capacity). The local infrastructure and economic climate have to be ideal for automotive production. And education/training facilities must be able to bring up to speed a motivated workforce. If this is to be a full production facility, not just an assembler of completely knocked down (CKD) kits, then look for a large green field space that has access to sustainable energy sources. It should be large enough to handle expansion and it would probably be laid out in the finger and palm orientation proven by the Spartanburg and Leipzig plants. In fact, Leipzig may be a good model for the facility if it is more than a CKD assembler. And, given the markets that this facility will serve, Leipzig is a good model. While the 3er will be built initially (and slowly – until everything is where it needs to be) the plant will probably concentrate on the next generation 1er, X1, MINI, and other BMW FWD offerings. BMWBLOG has a nice piece on the new family of 3,4, and 6 cylinder engines here (https://www.bmwblog.com/2014/05/21/bmw-modular-engines-b37-b38-b47-b48/). And we’ve been reporting on these engines since 2011. The beauty of the 500cc common combustion chamber is its efficiency – both in fuel economy and production costs. Both 3,4, and 6 cylinder diesel and gasoline engines have 40% of their componentry in common. The common parts percent goes up to 60% within each fuel type. Pistons, connecting rods, wrist pins (gudgeon pins), valves, valve springs, Valvetronic pieces, bearings, and fasteners are common. There are savings for volumes, and reduced expenditures for machinery to assemble the engines as all engines in the family can move down the same production line. And the physics of combustion are the same for each engine – reducing software development costs. That could result in significant savings. 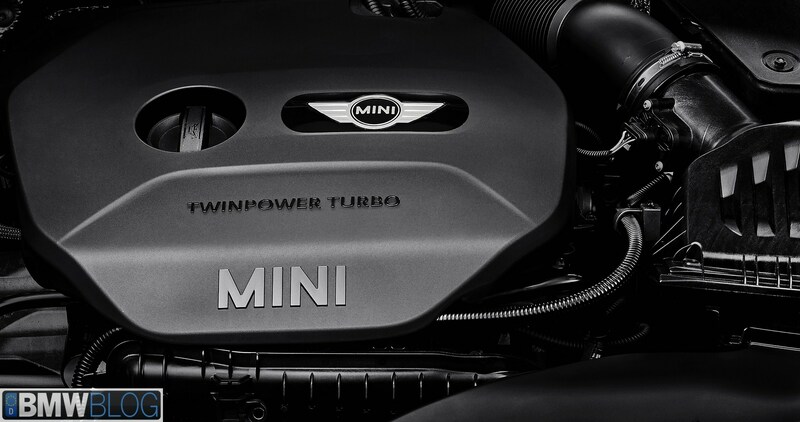 The engines will show up in the i8, the new MINI, and soon the 2 series Active Tourer and move through the rest of the family in the near future. Wow! Just wow! 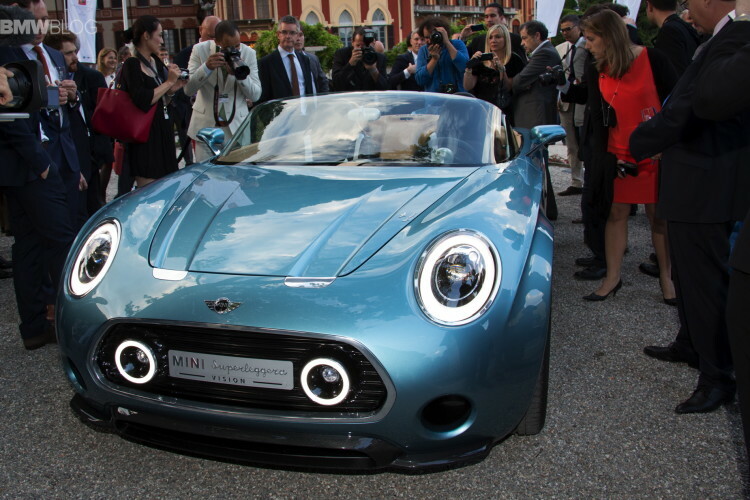 If you are not familiar with Touring Carrozzeria, there is this page (http://www.touringsuperleggera.eu/en/home.php) and, of course, the MINI Superleggera Vision is up front on the page. BMW has a history with Touring that stretches back to race cars developed for BMW during the early days of World War II. 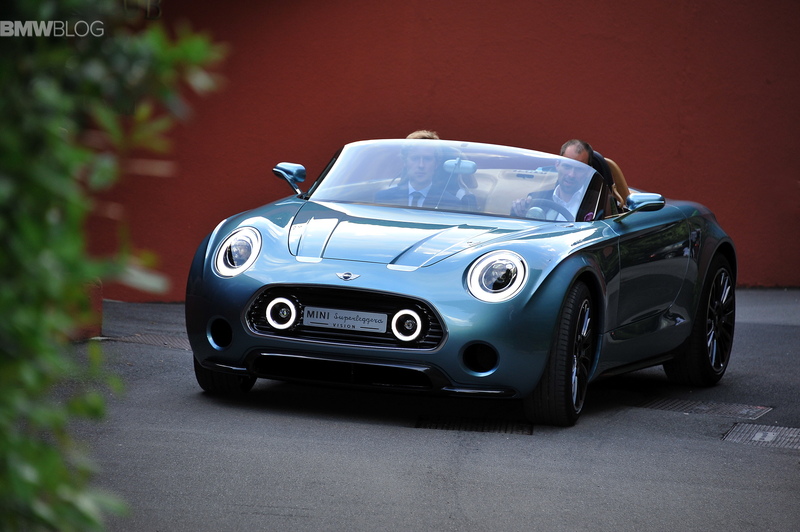 Superleggera is interpreted as ‘super light’, and while no specific details were given of the construction, one imagines that beneath the sleek hand formed aluminum skin is a carbon fiber passenger cell mated to an aluminum chassis that carries the electric motor and batteries. The minimalism expressed in the design of this car is wonderful and then there are the charming little details, like the split Union Jack rear tailights and the vertical CHMSL in the dorsal fin. Front drive or rear drive, my guess is rear drive – a chassis not unlike a short wheelbase version of the i3. The lines are simply beautiful in the rear of the car and the bespoke, ‘Como’, blue paint is perfect. Sign me up – put the 3 cylinder B38 in it – keep the interior intact and I’ll take one. This is a delightful little machine.